Want to only promote a few events? Or only one? 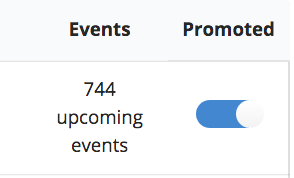 In the case that you want to promote another organizations events, but don't want to promote ALL of their events, you can toggle which events you would like to appear on your Events Feed. First, you need to be promoting an organization. Go to the Promote Organizations tab in your dashboard and locate the organization whose events you would like to promote (Pro Tip: use Control-F or Command-F to search for the organization's name), hit the promoted toggle. Blue means you're promoting this organization. 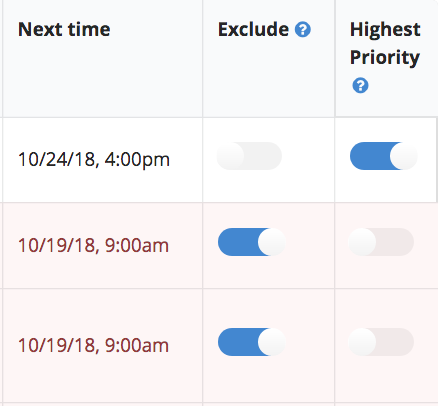 Here you can choose to exclude specific promoted events from appearing on your Events Feed. Simply toggle the exclude column.